The OC market continues to see competition for attractive, progressive and flexible primary workspace as “repositioning” remains a favored real estate strategy. When owners and landlords initiate an overhaul of common areas to support collaborative activities and lifestyle amenities, both established firms and start-ups can often be enticed to take less office space per person in exchange for these updated, flexible areas that are shared with fellow tenants. With lines blurred between work and play, the positive perception of work/life balance engendered by these amenity spaces can be a differentiator as firm leaders seek to recruit and retain staff in a competitive marketplace, suggesting that the contemporary work environment is all about creating the ultimate inner-office experience. Technology is key to many of these progressive amenities. Savvy clients, familiar with flexible workplace planning concepts, already know terms like “hot desking”, “hoteling” and “virtual office”. Information access in these new common areas must also gratify immediate needs, whether for interactive wayfinding, live news, promotion or knowledge sharing, and rapidly changing technology influences their design a step further. A space, facility or amenity featuring technology must be designed with the flexibility to allow for equipment upgrades, monitor size changes, orientation and mobility if it’s to continue exceeding the expectations of tomorrow’s tenants. And while a campus environment can offer everything from cafes to fitness centers, bocce courts and medical clinics, we note a strong desire to position amenities immediately adjacent to tenant space so that they function as an effective extension of the primary workspace. In a recent concept design, Westgroup recommended this strategy to one of our corporate clients. To modernize common areas within a pair of high rise towers originally built in the 1980s, Westgroup enhanced their visual appeal by substituting wood veneered panels for the original dark granite interior walls and matte finished stone tile for the highly-polished floor, removing associated ornamental stone and metal detailing, softening the existing sharp angles, and infusing the spaces with both natural and diffused light. Removing thick, ornamental, stone-clad columns throughout the second-floor lobby revealed a larger, brighter, more open and flexible space, perfect as a shared tenant commons for lounging, meeting, collaboration, game room and more. 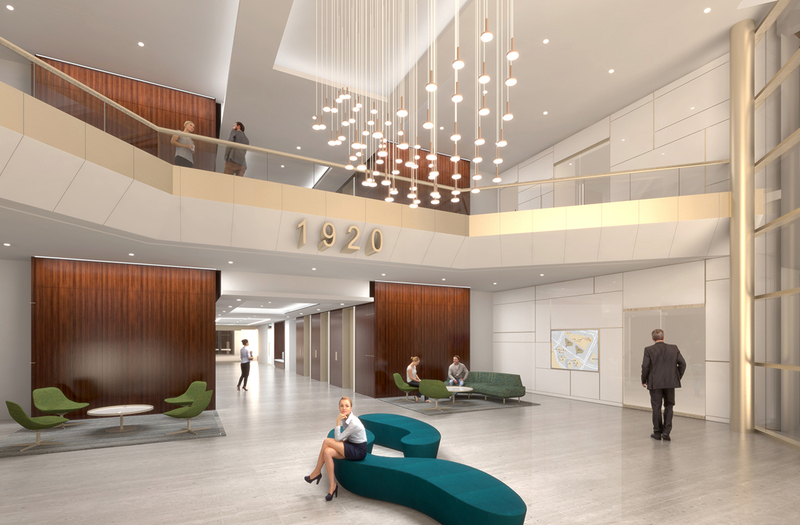 Creating “touch down” as well as appointed activity spaces with both high-tech and high-touch features offers new and unparalleled value to tenants, who will be able to enjoy these benefits without leaving their building.